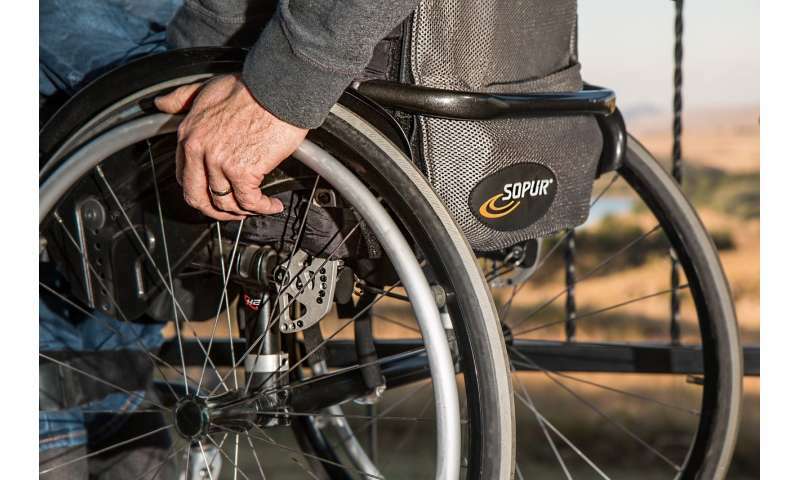 A study led by Heriot-Watt University has explored how individuals with spinal cord injuries perceive the space around them. The findings suggest additions are needed to the rehabilitation programmes adopted post-injury to allow the whole person to be treated, not just the physical body. At present, approximately 25 percent of those with spinal cord lesions who have retained sensory function fail to regain the use of their lower limbs. By delivering mind rehabilitation, in partnership with physical rehabilitation, the research team believes it could improve the outcomes for some individuals, potentially allowing them to regain movement in their lower limbs. The study, "Affordances after spinal cord injury," published in the Journal of Neuropsychology, explores how individuals with spinal cord injuries perceive the space around them and the properties of objects in close proximity. The findings demonstrated that, even when an individual's upper limbs are unaffected, a condition known as paraplegia, the injury still affected the person's ability to move freely. It changed their perception of their reach and how they perceived the space in front of them. These changes can affect a multitude of everyday tasks ranging from lifting a cup of tea and eating to daily self-care. The research could help the NHS, charities and other organisations supporting individuals currently living with paraplegia, ranging from additional neurological exercises and complementing their physical rehabilitation regime to providing new insights into how their homes should be adapted. Dr. Anna Sedda, assistant professor of psychology at Heriot-Watt University, was principal investigator, working in collaboration with researchers and experts based in Italy, Switzerland and the UK. Dr. Sedda explains: "The study provides evidence that the physical change occurring in the ability to move around freely in paraplegia has a direct influence on how our brain translates an object's properties into sensory signals. "By comparing the results of individuals with paraplegia and individuals of the same age who have no spinal cord injury in computerised tasks, we found that patients with paraplegia do not overestimate the space they can reach with their hands, as one would normally do given our ability to push a bit further using our torso. "They also show more variability in spatial judgements which are not helped by having the target objects moved nearer to them. The findings suggest that individuals with paraplegia do not make use of an object's properties that are related to the subsequent action, and that this difference in perception is related to the everyday experience of using their body differently after the injury. "These results are important because available therapies for spinal cord injuries focus on treating the physical body. However, as demonstrated in the study, the changes occurring in the physical body also impact on the "representational body," in other words, how our brain processes the environment and its object before we take action. Consequently, by only training the body to do the actions and not supporting the cognitive component, individuals may fail to make improvements. "At present, approximately 25 percent of those with spinal cord lesions who have retained sensory function fail to regain the use of their lower limbs and we don't yet know why this is. By delivering mind rehabilitation, in partnership with physical rehabilitation, we believe we could improve the outcomes for these specific individuals, potentially allowing them to regain movement in their lower limbs." Dr. Sedda is hoping to establish a specialised network that will allow knowledge from studies on body representation to be translated into modifications and input for the rehabilitation of patients worldwide.